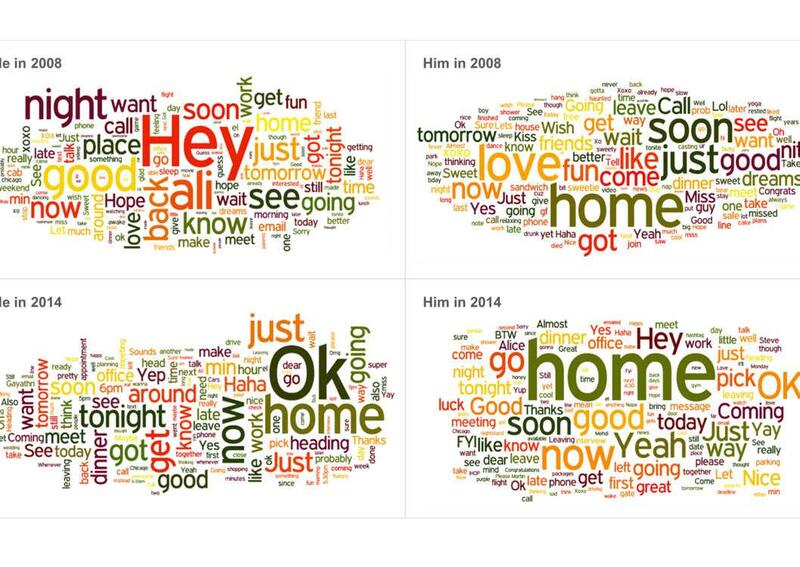 Texting and marriage: The way you text your significant other changes over time. When you’re in a new relationship, you waste endless words telling your partner how much you looove him or her. After you’re married, the conversations shift to the things that really matter. Things like dinner. You no longer greet each other. Zhao found that while she and her husband were dating, she was more likely to include hey in her texts; now, her most-used word is ok. She writes, “I seem to have decided to no longer greet my husband, but instead agree with most of the things he texts me.” Married life: all about keeping the peace. Her husband, on the other hand, was and is a bit of a homebody; his most-used word in texts to her, in both their years of dating and marriage, is home. She reasons that this is because they now spend most of their time together, so text messages are mostly for confirming plans and working out logistics. You don’t spend all night texting anymore. And why would you? If you’ve got something to say to your significant other during the wee hours, a nudge and a mumble will do, because they’re likely sharing the bed with you. Zhao found that when she and her husband were dating, they seemed to start thinking about each other around 3 p.m.; the texts started then and lasted as late as 3 a.m. Now, they’re most likely to text during the workday, which makes sense, because, again, most of the rest of the time they’re probably together. 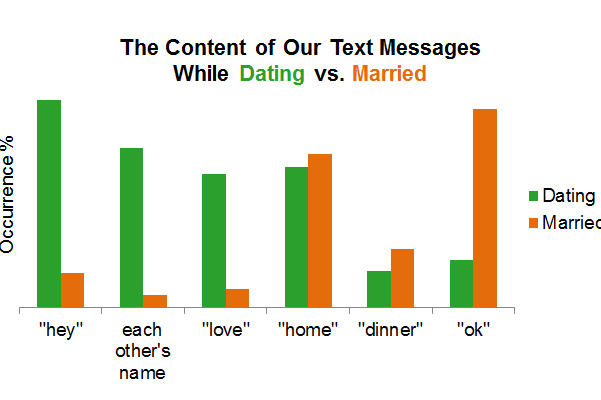 So marriage in text messages is kind of like marriage in real life: predictable, maybe. But in a nice way.